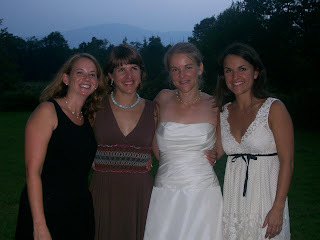 This weekend I attended my college roommate's wedding in New Hampshire. I set off late Friday afternoon, child-free and husband-less, sunglasses on, radio blaring, air conditioning cranked, Red Bull in hand, bound for Manchester to pick up another college roommate ("S") flying in from Arkansas, also child-free and sans husband, for the weekend. Yes, we totally planned it that way. Admittedly, though our bodies may be less firm, our faces a little wrinkly more mature, and we are physically much more tired than we ever were when we pulled all-nighters in college; though our hair may be styled and flat-ironed and we may be a little more experienced in applying makeup [SIDENOTE: I attended an all-womens college that was very tree-hugging granola and rah-rah women. We NEVER wore makeup or styled our hair. Seriously. ], some things still haven't changed since our 1995 graduation: S and I can get right back into our groove of silliness and snarkiness with no hesitation. It's comforting to know that there's someone out there who has the same wry and sarcastic humor as me. That, I know, will never change, no matter how "mature" we become. The whole day was simply lovely. Oh, and fricking HOT. Heatwave hot. The Bride looked like she was melting during the ceremony in the quaint stone church. My carefully straightened and smoothed hair morphed into Roseanne Rosannadanna within seconds. After the ceremony ended, S and I were psyched to meet up with our other roommate "J" and her new husband who had come from Idaho. (in case you're wondering, there were 5 of us who shared a house together. Only one friend couldn't be there.) S and J hadn't seen each other for 8 years! It had been over 3 years between meet-ups for J and I. Time to party and catch up! And we did. For hours and hours. So fun. The entire weekend was a combination of nostalgia, comfort, ease and true joy at seeing the old friends in my life so content and settled. So cheers to 80 Monroe, gals! We've come a long way, baby! Sounds like a lovely time. Good for you (and the saintly daddy back in the trenches) for carving out some Sarah time. SO fun! I'm heading back to Michigan this fall for my 20th year high school reunion, sans the husband. First I was bummed he didn't want to go, now I'm just glad I have a free babysitter :). Nothing beats old friends. Bummer though that I can't eat between now and November! Looks like a gorgeous wedding. 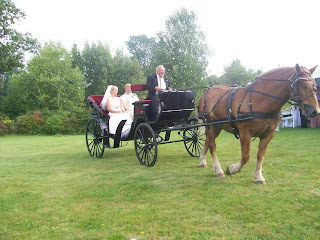 The bride was beautiful! And I couldn't even tell that she was hot. I miss my own college buds. It's been way too long. This reminded me to change that. Thanks. Sounds like a great time! I love getting together with old friends...and a chance to do it without kids and hubby makes it that much better! Aw, you don't look wrinkly at all. I need a weekend away with my friends. Now. Must go pout and stamp feet now. Yes, Saturday was sweltering. 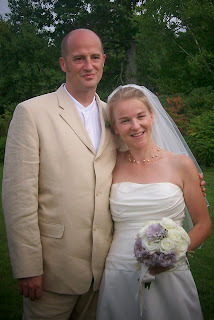 Amazingly, though, in those pictures the bride manages to look glowing, and not oily! Amazing how a happy day can do that! Glad you had so much fun! We missed you at the NE Mamas meet-up though! Oh what a beautiful bride. There really is nothing like old friends. I hope you enjoyed your time out of the trenches. Nothing like nostalgia mixed in with present blessings. Cheers, to all of you. Ah the rise in the distance. Reminds Bossy of her laundry pile. Sounds like fun. Sometimes it is a lot of fun to see old friends.